Jenny H. lives in Michigan with her husband, Chris, and three children, Alexander, Rebecca, and Samantha. Recently, the family raised money in support of freshwater wells. We have found that our children can have fun doing just about anything, especially serving. So when a dear friend told us about a service project their family did that was centered on Matthew 25:35-40, our kids were excited to do it too. We focused on a different portion of the Scripture each week for six weeks and talked about ways to bless others by giving and sacrificing our time and resources as we remember the ultimate sacrifice of Christ on the cross. The second week we talked about the portion of Scripture that reads, “I was thirsty and you gave Me drink.” Our three children got busy making plans and decided to offer our dog-owning neighbors and friends a one-hour dog pampering service to raise money to dig a well for those in need of fresh water. 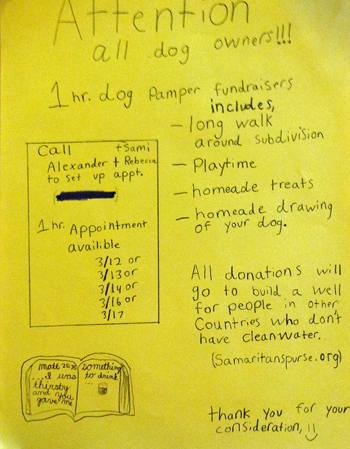 They made a flyer to distribute that advertised the dog pampering services they offered—a long walk around the neighborhood, homemade dog treats, a hand-drawn portrait of the pet, and lots of love and attention. When grandma and grandpa learned of the fundraiser, they generously offered to match all donations up to $100. 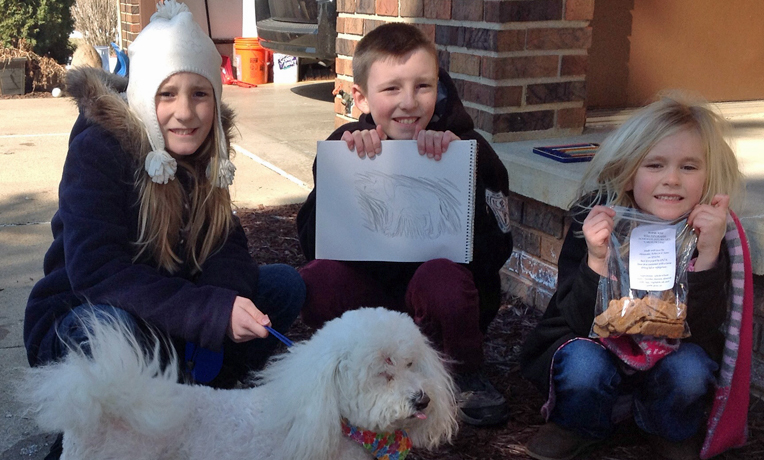 Soon, the calls were rolling in, appointments were set, and dogs were pampered. Within one week, most of the neighborhood dogs had used our services, and $280 was raised to donate to the Samaritan’s Purse freshwater wells project. To God be the glory! YOU CAN GIVE TOO. BROWSE OUR CHRISTMAS CATALOG. “Then the righteous will answer Him, saying, ‘Lord, when did we see You hungry and feed You, or thirsty and give You drink? When did we see You a stranger and take You in, or naked and clothe You? Or when did we see You sick, or in prison, and come to You?’ And the King will answer and say to them, ‘Assuredly, I say to you, inasmuch as you did it to one of the least of these My brethren, you did it to Me,’” (Matthew 25:35-40, NKJV).